Thanks to the efforts of those that created and maintained the trail through the years, last fall Alicia Raish of OC Parks nominated the trail to receive the National Recreational Trail Designation. Formally known as the Aliso Creek Regional Riding and Hiking Trail, after careful deliberation the Secretary of the Interior granted the nomination, so we ask that you join us in a small celebration Thursday 10/18/12 at 10:00 to witness the unveiling of a special sign designating the Aliso Creek Regional Trail as a National Recreation Trail. The celebration will take place at the rest area on the trail located off of El Toro Road, a stone’s throw SW from Marguerite Parkway in Lake Forest. 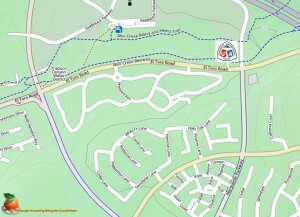 Or for those more familiar with the trail, just before the underpass by Saddleback Church. Hike, Bike, or ride your pony to the event! Here’s the map, ceremony takes place at the National Recreational Trail sign. See you there! Q: What does the designation as a National Trail mean? A: Recognition. We will be listed with American Trails; the National resource for trails and greenways. This nonprofit organization works to enhance and protect America’s network of interconnected trails. Q: With the designation, does ownership transfer? A: No, ownership will always remain with the County of Orange. The designation could help with plans to extend the trail, and obtain grants from other foundations, or partnerships. Q: Will Federal money be used to maintain the trail, and if so at what cost? A: No Federal money will be used on the trail. 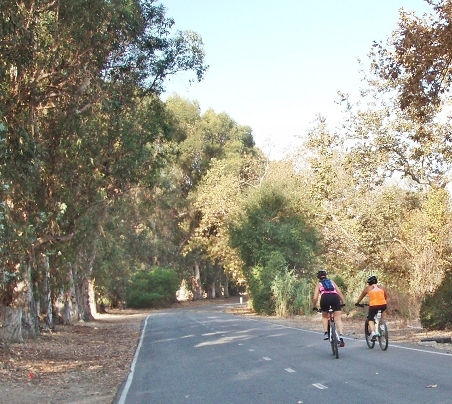 Q: Are there any plans to implement a segregated trail for bikers and “hikers”(this includes the dog walkers, stroller moms, and runners) – this is important due to the rapid density growth that is happening along all OC trails. A: Sections of the Aliso Creek Regional Riding and Hiking Trail are already separated from the bikeway, and are on the other side of the creek. After construction for the sports fields in Lake Forest, we will plan on adding signs and other features to encourage slower traffic to utilize the soft trail for walking and running. We have made suggestions to acquire additional property from Home owner’s association and flood property to construct a soft trail on the entire length of Aliso Creek Trail. Plans were also submitted to have Aliso Creek Bikeway continue to PCH. There are 1.5k & 2.5 mile open water swim and a mini-aquathlon suitable for kids as well as the international distance triathlon and the Du. The spectacular venue at the lake, the pristine ride through Santiago Canyon, and the primarily off road run through the hills of Mission Viejo will bring the 7th Annual OC Duathlon to the next level, and it will soon become a major stop and a “must do” on the Duathlon circuit. bike a portion of Santiago Cyn and probably a small portion of the Aliso Creek Bike Trail from Santiago Canyon to the transition area by Marguerite and El Toro. 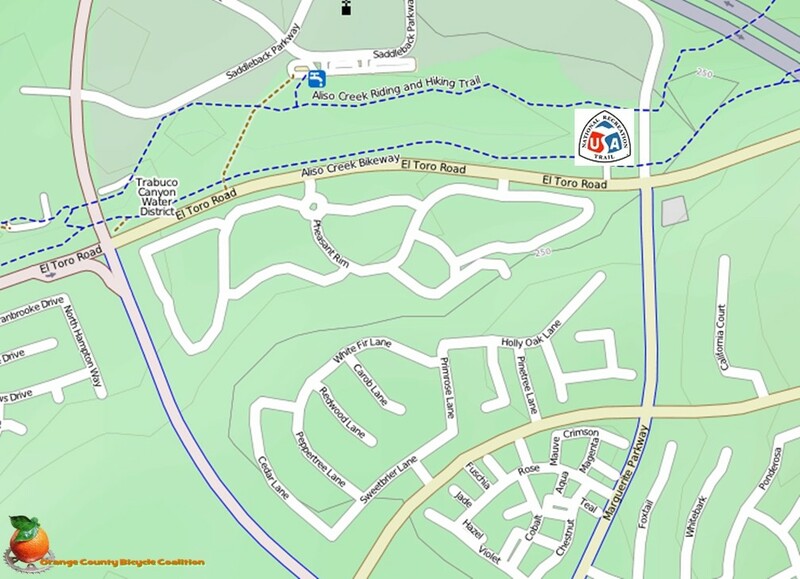 If this event is close to previous ones, riders will bike from Olympiad onto Marguerite, then onto El Toro / Santiago Cyn to a turnaround spot, then heading back along Santiago Cyn, enter the Aliso Creek MUP down to the parking lot by Marguerite to begin the run back to the lake. Turnout is usually pretty good for this event as it is sanctioned by Triathlon USA. Be on the lookout for traffic controls during the morning in these areas.